The number of interested students multiplied from seven to hundreds, and so a charter for The Temple College was issued in 1888. It was clear that the first president of Temple had a mission to help further the lives of those who earnestly sought advancement. 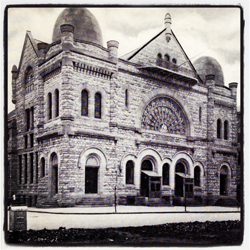 In 1907, Temple College became Temple University. 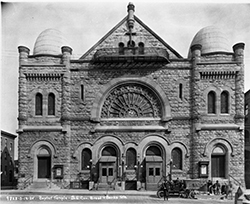 Among the most notable changes over the years was the 1951 installation of the Chapel of Four Chaplains in the west end of the building's lower level. The multi-denominational chapel was constructed to honor the heroism of four World War II Army chaplains of different faiths (one of whom was the son of Grace Baptist Church pastor Reverend Daniel Poling) who gave up their life preservers to save others on the sinking U.S.S. Dorchester, which had been torpedoed off the coast of Greenland. 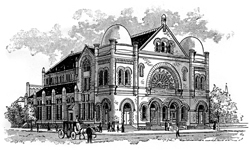 In the mid-20th century, The Baptist Temple became a stop for some of the country's most important intellectual and political figures. 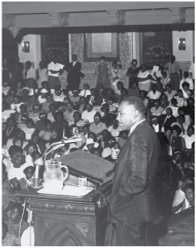 Martin Luther King, Jr. and President Franklin D. Roosevelt spoke there, as did anthropologist Margaret Mead. Anne Sullivan and her famed pupil Helen Keller spoke at the Temple as did General Eisenhower when he was president of Columbia University. 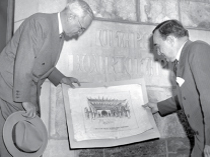 Alistair Cooke and Edward R. Murrow also delivered commencement addresses at The Baptist Temple. The University purchased the Temple in 1974. The building was certified by the Philadelphia Historical Commission as an Historical Building in 1984, and in 2003 it was designated by the American Institute of Architects as a Landmark Building. Today it is called Temple Performing Arts Center and it is Temple University and Philadelphia's newest venue for arts, events and ideas.